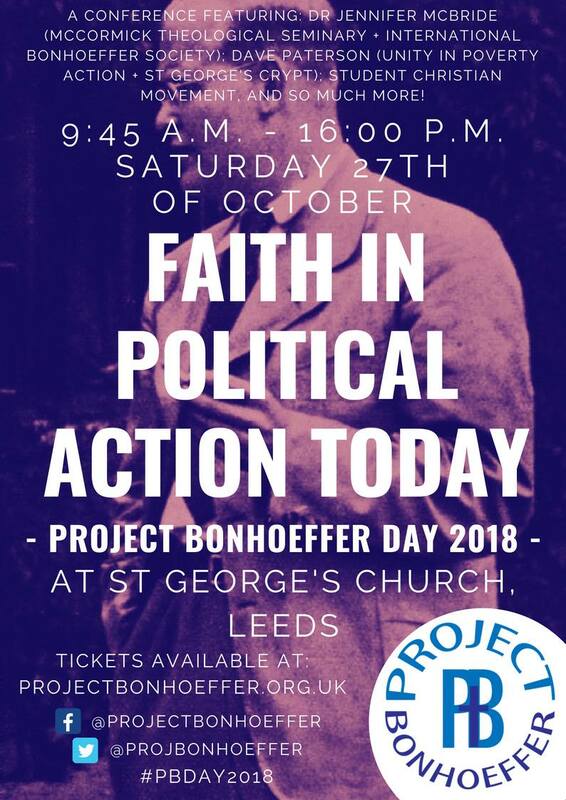 Join us for Project Bonhoeffer’s 2018 Conference - for all seeking to understand how Christianity can shape social and political change in today’s world. A leading authority on Bonhoeffer’s thinking, Professor McBride also has a deep commitment to his legacy. She invites all of us to rethink, as he did, what the Gospel is all about and how today’s disciples can bring together theological reflection and public engagement to address contemporary issues and conflicts by helping to heal the wounds of all who suffer poverty, pain and injustice; standing in solidarity with all who society scapegoats, despises and rejects; so building Christ’s kingdom of justice, mercy and peace in the here-and-now. Professor McBride is author of The Church for the World: a Theology of Public Witness (2011) and Radical Discipleship: a Liturgical Politics of the Gospel (2017). David Peterson of Unity in Poverty Action and St George’s Crypt, Leeds. Known in Leeds for his ‘hands-on’ engagement in action to ways in which Christians and others can care for, support and empower those in the community who are rejected and misunderstood, hungry, homeless and helpless, Dave will speak about his personal experiences in putting his Christian faith into action. The conference will take place at St George's Conference Centre in Leeds on Satruday Octoebr 27.